Sometimes described as the “Ferrari of dental implant rehabilitation,” full arch implant supported restorations allow you to eat and function like having natural teeth. These restorations are stable, strong, and do not need to be removed. They preserve your facial appearance and stabilize bone levels. 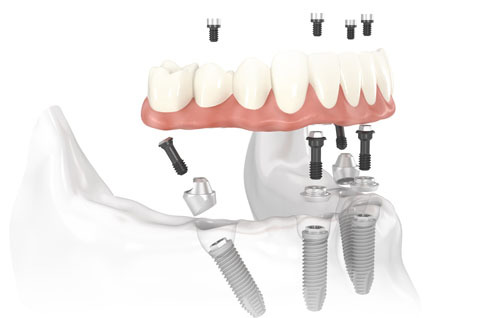 The number of implants needed per arch to complete this rehabilitation is different for each patient, but traditionally 4-8 implants are needed in the upper jaw (as bone is less dense) and 4-6 in the lower jaw to support this type of restoration. We will work with you and your restorative dentist to rebuild your new smile from the foundation up.